Dropping out of college was easy. Keeping a cover band working in the 70's was even easier. But when Joe Chiofalo and his then band mates started recording his material in search of a record deal, the usual pitfalls ensued. Drummers found god, bass players found love, guitar players found real jobs and Joe found himself starting from scratch again and again. With the help of an engineer friend, Joe started working as a studio keyboard player. But it was the accordion that landed him the gig on The SAINTS, Prodigal Son album, and subsequent tours in Australia and Europe. A soon to be life long friendship with the Saints captain Chris Bailey would bring the two together again in Memphis for work on Demons. It wasn't long before the squeeze box hit pay dirt again. Mary Lee Kortes was looking for an accordion player and soon, with the addition of guitar great Andy York, Mary Lee's Corvette was the new trio on the block. Joe played on three albums with MLC and then started writing music for television and radio, as well as playing on various national spots including Monday Night Football and NBC News. After co-writing the theme for the "TBS Basketball Game of the Week" which ran for five years, Pajamas would find himself re-entering the world of REAL music once again. Pajamas hooked up with Stephen Butler who also worked with Mary Lee, and they agreed that their common musical backgrounds and tastes would work well together. Steve would not only be playing guitar on the new CD, but he would be producing it as well. 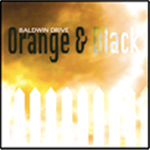 Joey Pajamas is proud to announce that his band Baldwin Drive has released their debut CD "Orange & Black" on Zip Records. Check out more information about Baldwin Drive and their new CD. Copyright © 2006- Joseph Chiofalo. All Rights Reserved.